Hashed Windows XP Shell Icons? Ice Storm of the Decade! Granted, the decade still has a few more years remaining. To name this post as I did when plenty of time exists for potentially worse disasters to strike Springfield, Missouri is proof-positive that last weekend’s successive storms are the worst we’ve had since I moving to this sleepy little Midwestern city. On Friday evening January 12th, after a full day of hard rain, the temperature began to drop rapidly. We were home a couple of hours after my son Evan’s basketball team practice when the power started flickering. Before we could finish our DVD (Harry Potter and the Chamber of Secrets) the power went out for good and hasn’t returned as of this writing! The four of us (Becky, Evan, Andrew, and me) crawled into our bed under a mountain of covers and made it through the first night. However, it was so cold the next day that when we learned of the storm’s severity and that we would have no power for days, we headed to Becky’s sister Lisa’s house. Lisa had no power either but did have an advantage of a gas fireplace to huddle around for warmth. We stayed at Lisa?s house, sleeping on the floor and navigating our way to kitchen, restroom, and hallway by flashlight. On the first evening we used the gas grill to cook burgers and diced potatoes in foil for a scrumptious meal. We also went to Cox Hospital and ate in the cafeteria for a few breakfast experiences and took advantage of electricity to charge batteries for lanterns and cell phones. 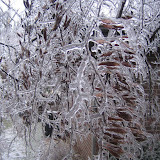 We continued to get freezing rain for three successive days. This built layer upon layer of ice on absolutely everything exposed to the weather. Although many boughs broke the first night, every successive moment wreaked havoc all over the region causing downed power, cable TV, and telephone lines in addition to major structural damage everywhere. The search for generators, kerosene, D-cell batteries, and the like proved fruitless at any of the businesses open and still with power or running on generator power themselves! 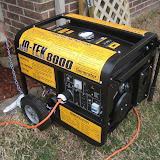 On the fourth day after the first storm I finally made it to the top of a waiting list and acquired our own generator. Last night was our first night with power and heat. ?It was glorious! I am so thankful that we experienced no significant structural damage to our home and no pipes froze to add insult to injury. The generator runs for nearly nine hours on five gallons of fuel. I completely disconnected our home from the city electrical grid and wired the genny directly to the electrical mains. Thus far, we’re running the entire home without issue excepting the range and dryer. I may even experiment with operating the dryer just to see what happens. We can live without the stove for a while. As long as the microwave remains functional, it will do just fine for now. I hope to return to normal work duties by the end of the week but need to finish cleaning up the carnage in the yard from all the downed trees before the next storm is slated to arrive this weekend. A predicted 4-8″ of snow is on the way Friday night. [sigh] Wish us luck!